In an earlier article The Ramadan Guilt Trip we learnt that 65% of Muslims interviewed for a report felt they could do better during Ramadan, and ⅕ were “very disappointed” with what little they managed to achieve! Like the majority of the Muslims interviewed, if you have had that sinking feeling in your stomach at the end of last Ramadan, then it is time to reassess our strategies in order to make the most of Ramadan this year, In sha Allah. After all, Albert Einstein did say that insanity is to keep doing the same thing over and over again while expecting different results! In one of the six simple but effective tips shared in the Ramadan Guilt Trip article, tip #3 was to start tracking your habits. Shaykh Ahmad Saad, in his insightful lecture on cultivating a relationship with the Qur’an, repeated many times throughout the lecture the importance of building one’s habits. Luckily for us, Alhamdulillah, many tools and applications are available today that are created specifically to help us build good habits. For this article, I tested seven such apps, each with its own unique flavour, and I hope the reviews will help you decide the tools you use to implement your strategy for this year’s Ramadan, bi’idhnillah. Note: All the apps reviewed, except for Lift, are available for iOS only. For Android alternatives, scroll down to the end of the article! 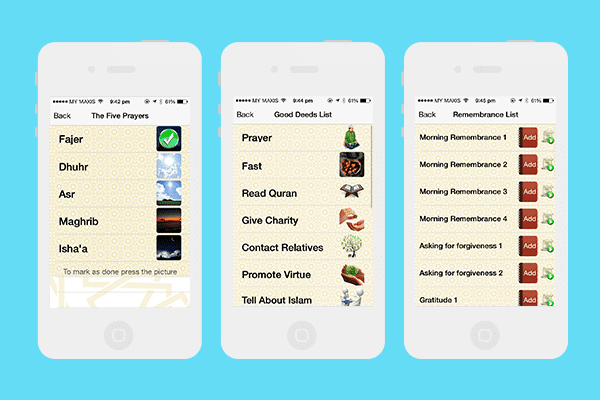 Al-Muslim is a free iOS application, available in both English and Arabic, that aims to help you keep track of your deeds and actions. Using terms such as “Today’s Intentions,” “Remembrance List” etc., it provides you with a checklist of various obligatory and recommended deeds you can perform throughout the day. Among other actions, you are given the choice to track your five fardh (obligatory) prayers; the different sunnah (recommended optional) prayers such as Duha, Witr etc. 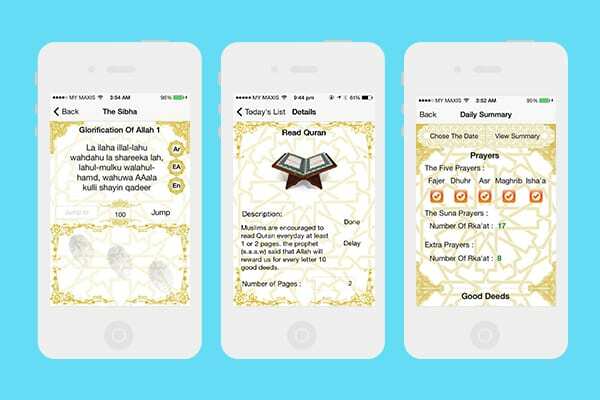 ; different deeds such as fasting, reciting the Qur’an, and even a collection of 25 adhkar (repeated devotional remembrances) included in the app in Arabic with both their translations and transliterations! The developer of the app has even gone a step further by providing a sibha or misbaha (traditionally, a string of beads to keep count), where you just have to tap the phone to count your adhkar. Additionally, there are short explanations behind the suggested deeds included in the app, providing subconscious motivations for us to adopt the deed for the day. Tracking the obligatory actions and adding the recommended ones into our daily habit list is easy: A tap of the related image will “check” the action off. At the end of the day, the app calculates and gives us a summary of all the deeds we have done, and with every subsequent day, provides a summary of all the deeds we have done in total. The ready-made checklist gives you a nice place to start if you do not know where to begin. With the checklist you can progressively add new habits once you are consistent with current ones. The adhkar and sibha functions provided in the app itself make it easier for you to perform the respective deeds. A ready-made checklist (i.e. not user expandable) means a limitation to what you can track. Taraweeh prayers, for instance, will have to be grouped under “Other Prayers” instead of being in its own category. So any of my daily adhkar that is not in the provided list has no way of being tracked. The design and interface of the app has much to improve. Often times I tapped certain images and words, and because the app showed no response to my touch, I assumed nothing had happened. In fact, the app had registered my actions, which I only discovered after a couple more taps. The daily and total summary are based on numbers and percentages. Good if you are great with numbers, not so if numbers put you off. There is no option for setting reminders. You want an app that is zero dollars, hassle-free, does what it is supposed to and is all-inclusive. Download Al-Muslim from the iTunes App Store. This free application is the Ramadan-specific variant of iSawab, the generic tracking-app. For those who love the concept of accumulating points, Ramadan Tracker allows you to set designated points for actions and set a target of points to achieve per day. 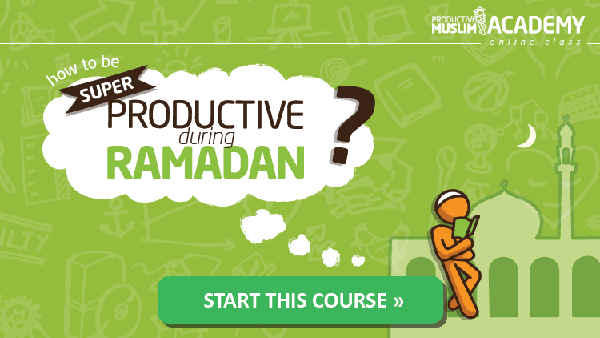 Just like Al-Muslim, Ramadan Tracker comes with a ready-made checklist of habits to adopt. However, due to its specific nature, a lot more Ramadan-specific activities and deeds are included, like having suhoor (pre-dawn meal before commencement of fast) and paying zakat al-fitr. Ramadan Tracker is also a little more specific compared with Al-Muslim in its attention to variations of deeds. 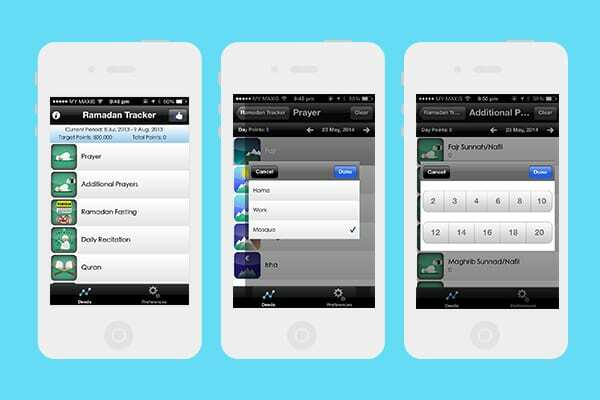 For example, for the five fardh salah, Ramadan Tracker asks additionally if you offered it at home, work or at the masjid. And when you check off a sunnah salah, the app prompts you to input the total number of raka’ah (a unit of prayer) you offered. Once you are done keying in your data for several days, you can then view your progress, in terms of the number of points you accumulated compared with the number of points you targeted. A handy graph is also provided for those who prefer graphics as opposed to numbers. Ramadan-specific checklist means you would not miss out on essential Ramadan deeds. More detailed input compared with Al-Muslim app (can be a negative if you just want something simple). Summarises data in a graphical format, making it easier to track progress at a glance. Like Al-Muslim, a pre-determined checklist equates to an inability to add more habits you may want to include later. The target and points system may be overwhelming for those who are not good with numbers. At the time of review, the current period shown on the app are the dates for Ramadan 2013. Hopefully, the developer will automatically update this to reflect this year’s Ramadan dates or better still, provide an option to set the Hijri date calculation method. 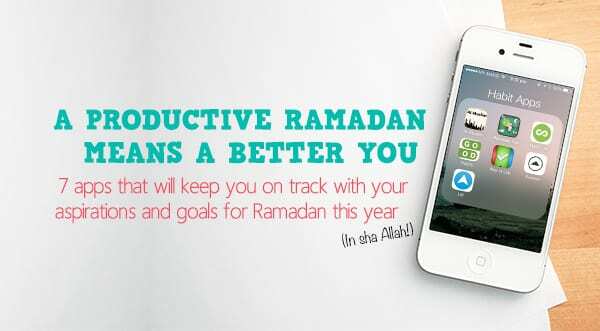 You want a free, Ramadan-only app, so you do not lose out on all the Ramadan-specific activities and are motivated by numbers and achieving target points. Download Ramadan Tracker at the iTunes App Store. 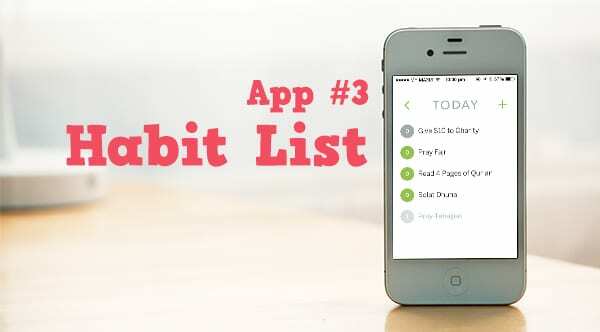 Moving away from the Muslim-specific habit-tracking apps, the third app I tested is Habit List, a $2.99 app on iTunes. Unlike the previous two, Habit List does not come with a predetermined checklist, allowing you to add habits that you want to inculcate. Adding a new habit is easy: Just click on the “+” icon in the top-right corner, key in the habit you want to build, determine how many times you want to do the action in a week and set a reminder for the app to send you a notification if you have not completed the action after a certain amount of time. The frequency option is super flexible: You can choose specific days from Monday through Sunday, or any other combinations that you can think of. The reminder notifications and badges too are an absolute plus for the times where you are so engrossed in work that you overlook the time for certain prayers such as Duha. 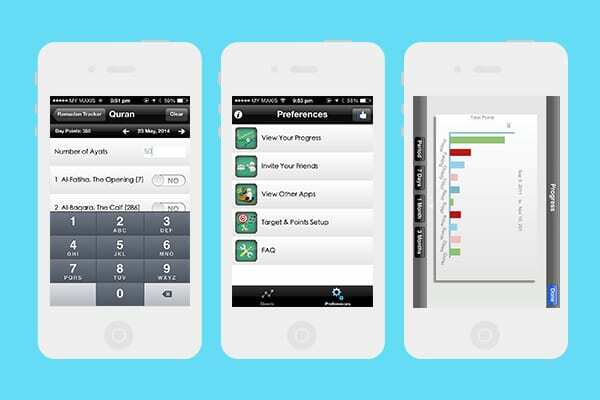 The Habit List interface also makes it extremely easy to track your habits at a glance. 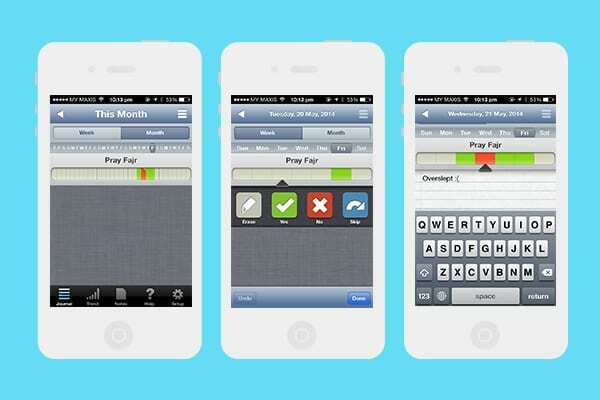 On the app’s home screen, you will see a list of all the habits you are tracking and the habits are colour-coded to show the “status” of the habit. Green means you are doing the habit consistently, grey means you are skipping that habit for the day, while red shows that you have not been doing the habit. The numbers in the circles indicate how many days you have been doing the habit consecutively. When you click on a specific habit, you will then be able to view that specific habit’s data in both calendar form and statistics form. In the calendar format, you will be able to see the days you completed the habit at a glance, while the statistics format (available in weekly or monthly options) will show you the percentage of your completion rate. You can add and track as many habits as you want, with great flexibility. The data collected by the app is shown to you in a very easy-to-read, visually appealing manner. You can set a pass code, so the information is strictly for you alone. It does not include a ready-made checklist (can be considered a good thing depending on your preference). You have to shell out a little cash to get a licence before you can use it. 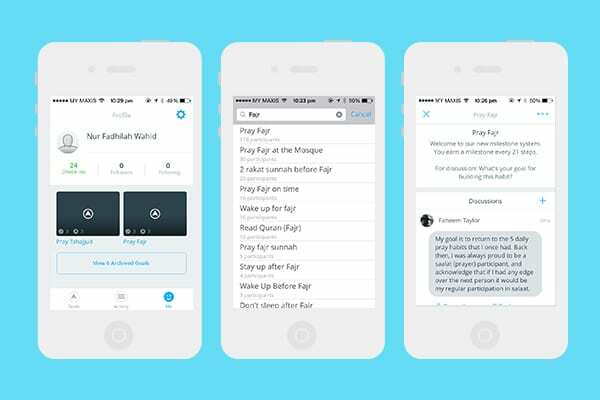 Money is no objection especially when it comes to using a beautiful and functional app, and you already know what habits you would like to inculcate this Ramadan. 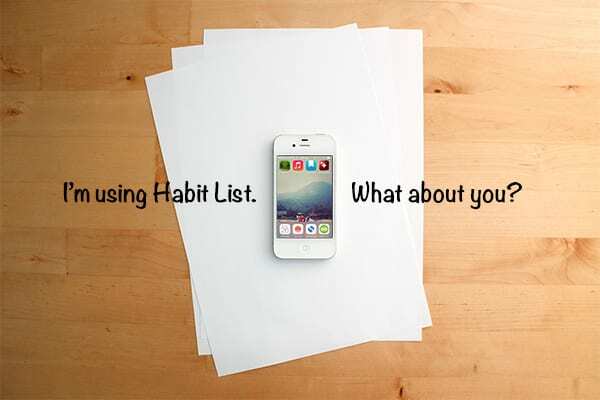 Download Habit List at the iTunes App Store. Imagine Habit List, but free and without the ability to calculate your data in statistical format; that is Good Habits in a nutshell! Just like Habit List, Good Habits comes without any pre-determined checklist and you are given free reign as to what habits you would like to track or build. Adding a habit too is just as easy: Click on the “+” symbol in the top right, key in your habit name, choose a time for the reminder to sound and select the days you want to carry out the habit. 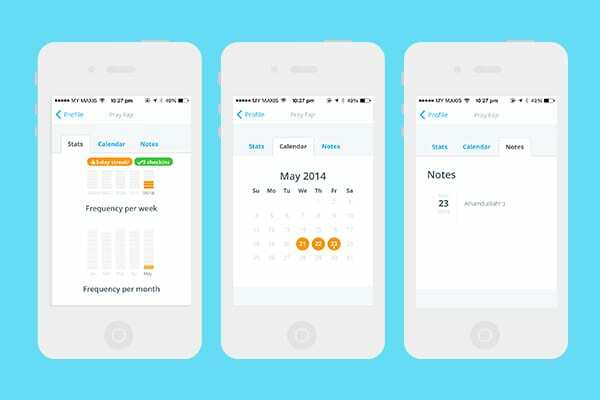 The app’s home screen will show you at a glance all the different habits you are tracking, the number of consecutive days you have been completing the habit (known as a “streak”) and the highest streak you have achieved. Clicking on a specific habit will bring up your streak in a graphical format, much like Calendar view in the previous application. 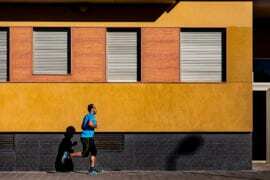 Days you dedicate as rest days will not disrupt a running streak and rightfully so! Does mostly what Habit List does, but free. Can add as many habits as you would like. Time-sensitive notifications and badges to remind you when you overlook a habit. No statistical output of data in graph form. No password or PIN protection. No pre-determined checklist, which means you will have to do your own independent research and what habits to inculcate for Ramadan. You do not care much about statistics (the “do not break the chain” method of habit-tracking does the job well enough for you) and you already know what deeds you would like to see done this coming Ramadan. 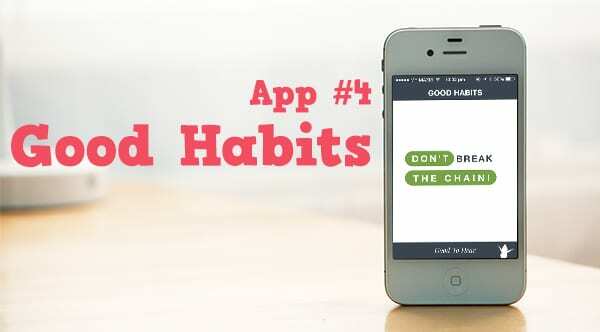 Download Good Habits at the iTunes App Store. Way of Life also models itself on the “do not break the chain” system. The app’s pricing is based on the “freemium” model, which means you can add up to three habits for free. However, to track more habits (unlimited), you would have to fork out $4.99. I think three habits is just fine to get started, should you be serious in ensuring that new habits are cemented before adding more. One of the mistakes I made earlier on in this journey of forming new habits was to add too many new habits in one go, only to abandon them all on burnout after a week or so. The Way of Life app is less specific and flexible compared with the previous two apps, in the sense that you are unable to choose the days you want the habit done. Instead, you would have to manually skip each day from the app’s home screen. 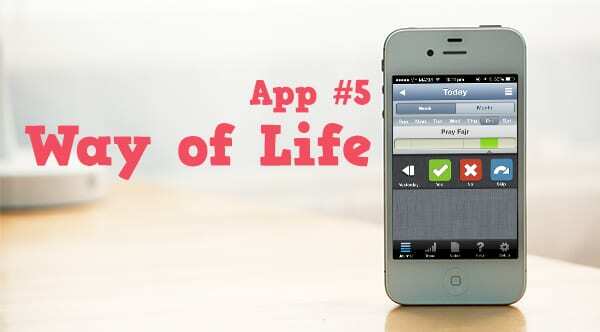 However, Way of Life has a function that the previous apps do not: The ability to add notes for each daily entry! This is very useful, as it allows you to analyse the reasons behind why you successfully performed an activity on a certain day or failed on another. For instance, looking at your notes, you might notice that every Friday morning you miss Fajr because you oversleep. This valuable information will then give you better insight on how you can ensure you wake up on time on Friday mornings. The data collected by the application can then be reviewed either as a bar chart or pie chart, where you will be able to adjust the axis by week, month, or even year. Talk about long-term data! Notes function is unique and very useful. Easy to analyse data and track habits at a glance. No pre-determined checklist for Ramadan. No individual reminders for each habit. App interface is pretty dated for a $4.99 app. You find high value in taking down notes to have a more in-depth analysis of your habits and you are perfectly fine with just three habits at a time. Download Way of Life at the iTunes App Store. Its focus on community support. It is available as a web app and on Android (yay!). Due to its focus on building a community, Lift first requires you to create a free account. Upon signing up, you have the choice of personalising your profile page (works like Twitter or Instagram, but for habits), or tracking your first habit straight away. Adding a new habit is a tad different in Lift because instead of pursuing the habit alone, you get to join communities of people who are trying to build the same habits. By searching the term “Fajr” for instance, Lift shows me a list of communities who are pursuing habits related to “Fajr”, from people who are trying to “wake up before Fajr” to those who are trying to “stay up after Fajr.” What is great about communities is that you get to exchange motivations and advice with those who are facing the same struggles as you are! Once you have chosen the community you want to to join, you are then able to adjust settings for that habit like your weekly target and time-sensitive reminders. To tackle your habits with greater privacy, there is also a handy privacy setting that allows you track your goals privately or publicly with select groups as appropriate. Tracking your habits on Lift is a wonderful experience. You get to view your performance stats in both the frequency-format (per week, per month) and the “do not break the chain” calendar-format, with the added bonus of being able to include notes. Another unique perk about Lift, not available in the other apps reviewed, is its offer of joining Coaching Plans (free). They are daily instructions to help you reach your goals. When you sign up for one, the plan will show up in your list along with an instruction for what to do that day. The steps for a Coaching Plan are sequential, so each time you complete a step, it unlocks the instructions for the next step. The next step will then show up on your Lift list the day after they check-in for the completed step. And the best thing about Lift’s Coaching Plan is that anyone can create a plan and get others to join. For example, for the month of Ramadan, you and your friends can form a group to read the Qur’an at the same pace, or to synchronise some other form of deeds together! Needs Internet to work, which is bad if you are somewhere with a poor Internet connection like where I am based. Tracking habits publicly might be uncomfortable for some (though you can always set your setting as private). 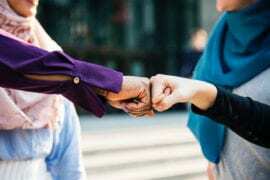 You love the idea of having a community to work towards a habit together, and your Internet connection is solid and fast round the clock. 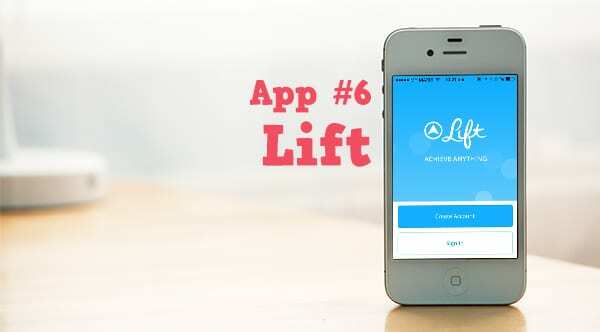 Download Lift at the iTunes App Store or at the Google Play Store. Alternatively, you can also use Lift from your browser. Our last app for today’s review started off as a purely habit-tracking app, but has recently evolved into a growing community of people sharing photos and text in the context of their journeys in life. 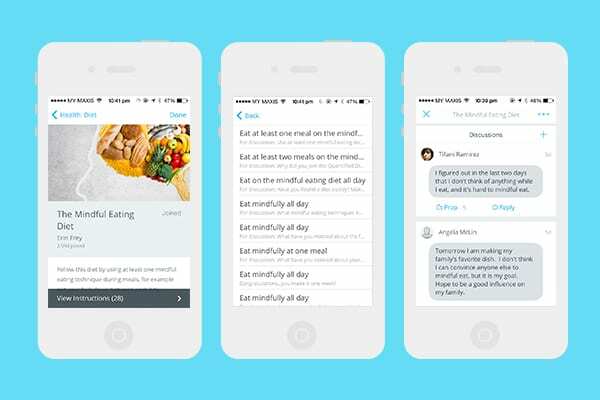 While other apps in this review focus on whether the habit gets done, Everest seeks to capture moments in the journey of getting that habit done. No reminders, no statistics, no pressure in continuing the chain. Instead, Everest asks that you document, through your photos and text, the different moments you go through in undertaking that journey of change. 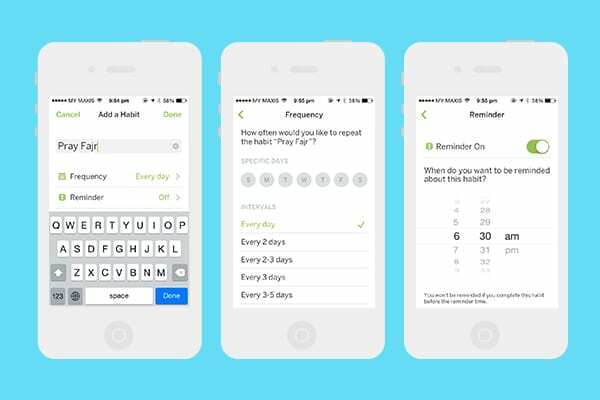 If the other apps are all about quantitative research, Everest is the qualitative one for habit tracking. You dislike the statistical approach to habit building, and find that a focus on the journey and memories themselves is more beneficial … and you love sharing and looking at beautiful pictures! 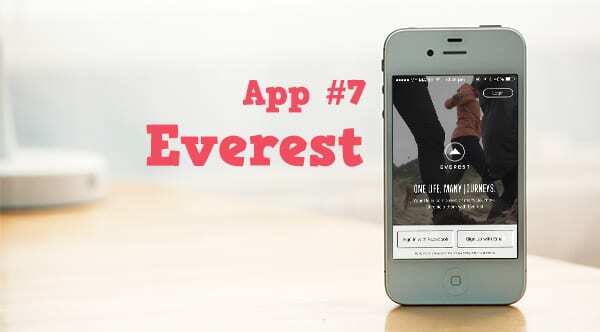 Download Everest at the iTunes App Store. The choice of app to use in your Ramadan strategy depends greatly on where you are and your preferred way of analysing your data, i.e. your habit-tracking results. 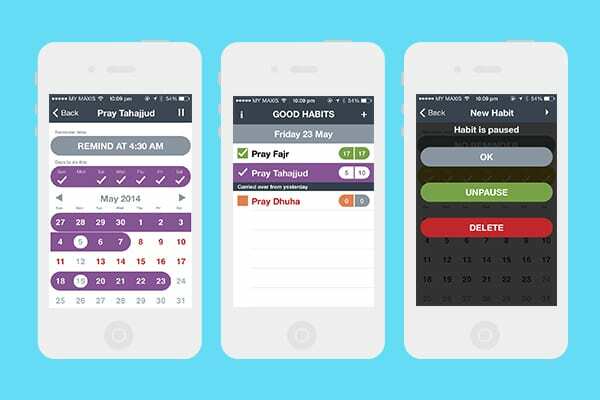 If you do not really know what deeds you need or can do during Ramadan, perhaps the two Islamic habit-building apps will be useful due to their built-in checklists. 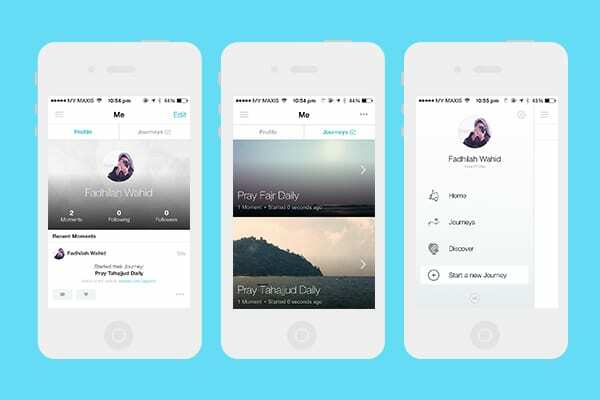 However, if you are aware of the different deeds you can do in Ramadan and already have in mind what you want to do, then I believe that any of the other apps will be more useful due to their flexibility. Additionally, your choice of app should be determined by taking into consideration how you read data: Whether you prefer numbers, statistics, graphs, chains or pictures. This will all affect your willingness and motivation to use the application continually! 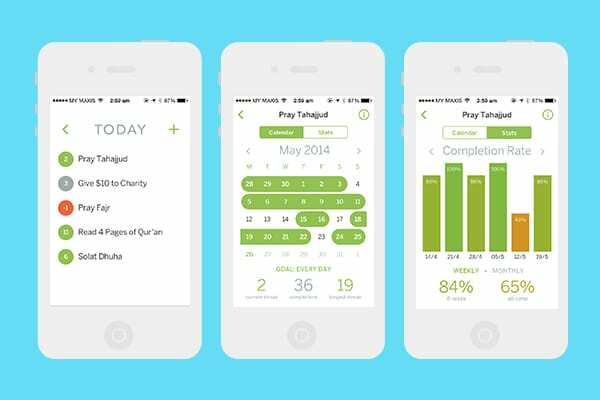 Tempting as it is to think that an app alone can help organise our activities in Ramadan, the hard truth is that an app is but only a means of achieving results. Although it is true that having the right means or tools will go a long way in determining the final results, true success in having a beneficial Ramadan lies in the blessings of Allah and on our own determination and discipline to practice istiqamah (steadfastness) in cultivating new habits. May Allah increase us in our good actions and remove the bad habits that are in us. May He accept all our deeds no matter how small, and may He grant us the opportunity to seek His blessings this Ramadan, In sha Allah. Ameen! But Have You Forgotten Us Android Users? Of course not! 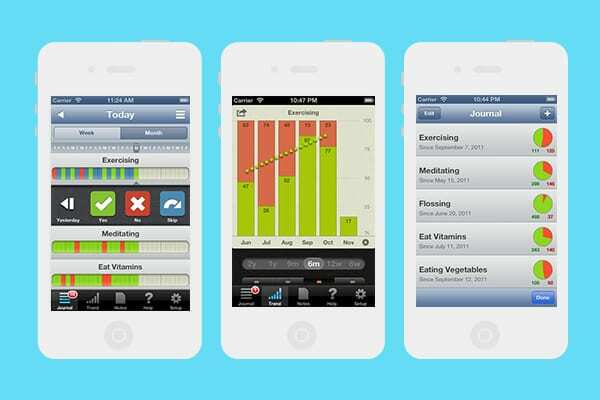 Below I have included seven Android habit-tracking apps I have found recommended on the Internet. 1. 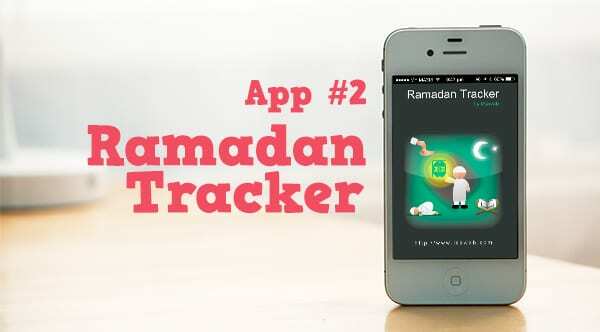 Ramadan Achievements (free): Equivalent to the Ramadan Tracker app reviewed. 3. Habit Streak Plan (free): Equivalent to “Do not break the chain” apps like Good Habits and Habit List. 4. Regularly (free): A habit tracker that allows you to categorise what is most important, colour code items that need attention and organise related tasks with tags. 5. Habit21 App (free, pay only if you fail to change your habit): Pledge a certain amount to friends whom you trust and give yourself 21 days to create a good habit or break a bad one. 6. Habitizer (free): A tool for those who are already committed to making changes and simply need to keep track of their progress or get reminders. 7. Goal Tracker Habit Calendar (free): A calendar view where you will be able to see which days you completed a habit and which ones you did not. As I do not have an Android smartphone, I am unable to test how awesome (or not-so-awesome) the above apps are. So, iOS and Android users, please do give the apps reviewed as well as the Android apps listed above a try and please share your findings and insights with us in the comments below for the benefit of the community.